Low-Cost Technologies for Rare Cells Analysis..
Rare cells are key in understanding, for example, how immune systems differ among individuals so that a few non- progressors (<0.5% of patients) can suppress the HIV infection without undergoing antiretroviral therapies. How can circulating tumor cells avoid anoikasis in blood stream and spread cancer to distant organs? 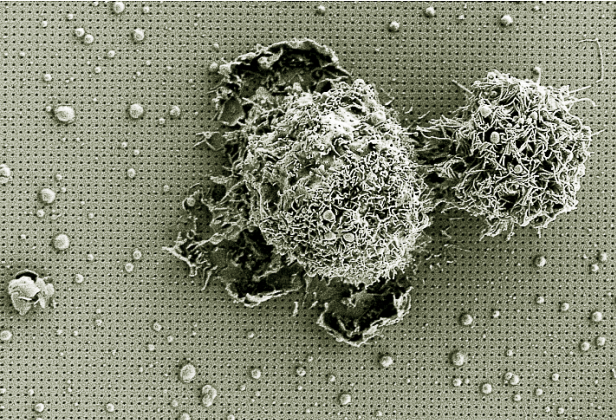 To answer these questions, there is a disciplined, consistent effort to develop on-chip techniques to isolate and analyze circulating rare cells. A critically important aspect of the cell functionality is the proteins secreted by these cells into their microenvironment. This set of proteins participates in most physiological processes including cell signaling, differentiation, adhesion, invasion, angiogenesis, metastasis and apoptosis. Today, the functional studies on circulating rare cells are confined to genomic analysis due to their weak secretion signal. However, expression of certain genes may not always correlate with the functional activity of the related signaling pathway.Combined with cell heterogenity, signaling pathways could be very complex. In addition of gene analysis, ultrasensitive technologies that can directly monitor secreted proteins from individual rare cells are needed. Progress in this field is mainly limited by the technical challenges. Isolation of rare cells is an extremely challenging task; there are approximately 10-1,000 rare cells per 10 billion red blood cells in human blood. To overcome this fundamental limitation, we recently introduced a hybrid scheme that can merge rare cell isolation and analysis capabilities into a unified platform. Using our novel approach, we demonstrated drastic enhancements in isolation efficiencies of rare cells with few surface marker proteins, a particularly difficult set of target cells. Based on the success of our earlier studies, we are currently testing ultrasensitive label-free analysis of weak secretome signals of rare cells.